MONDAY, Jan. 16, 2017 (HealthDay News) -- Children exposed to addictive drugs in the womb may be more likely to perform poorly in school, Australian researchers report. In the study, these exposed kids lagged behind their peers on grade-level tests of reading, writing, math, spelling and grammar. By seventh grade, about 38 percent failed to meet test standards in at least one of these areas. The study authors said their paper is the first to examine academic results in children with neonatal abstinence syndrome (NAS) -- when a fetus is exposed to drugs in the womb. It's a rapidly growing public health problem fueled by the global opioid epidemic. In the United States, it's estimated that an NAS infant is born every 25 minutes, the study authors said. Opioid painkillers such as morphine, Percocet (oxycodone/acetaminophen), OxyContin (oxycodone), Vicoprofen (hydrocodone/ibuprofen), and the illegal opioid heroin are responsible for many cases of neonatal abstinence syndrome. After exposure to these substances during pregnancy, babies experience withdrawal symptoms such as excessive or high-pitched crying, tremors, seizures or twitching, diarrhea and sweating, according to the March of Dimes. Yet little is known about these kids' long-term outcomes, the study authors said. Dr. Stephen Patrick, urged caution in interpreting the study's results. Patrick, who wasn't involved in the study, is an assistant professor of pediatrics and health policy at Vanderbilt University School of Medicine in Nashville. A slew of factors, from children's home environment to the medications they receive to manage withdrawal symptoms, could account for poor long-term outcomes, he explained. 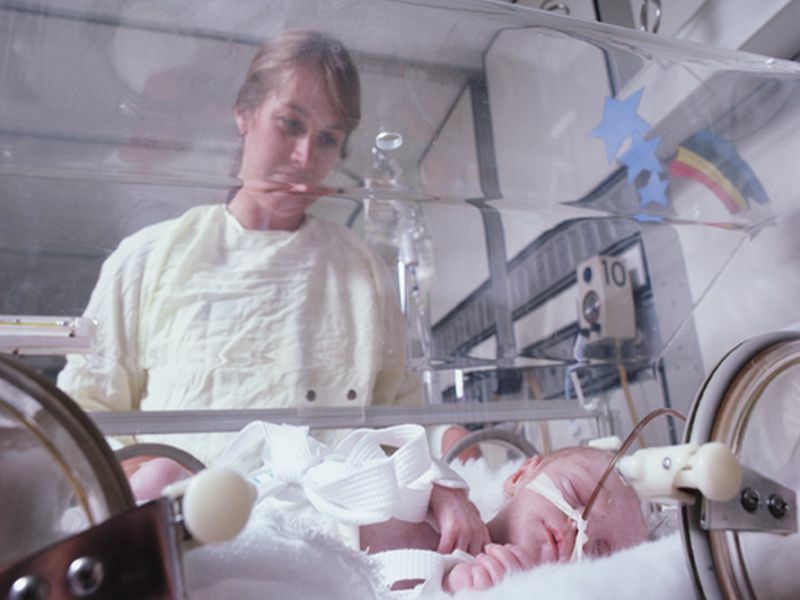 Still, Patrick added, "We should be worried that there may be some long-term educational issues for infants with neonatal abstinence syndrome. For me, what it really calls for are prospective studies for us to look at this in the United States." The study included more than 2,200 children born with neonatal abstinence syndrome in New South Wales, Australia, between 2000 and 2006. The researchers based their results on tests given in third, fifth and seventh grades. They compared the children with NAS with a control group of over 4,300 kids unaffected by the syndrome. Both groups were matched for socioeconomic status, gender and time spent in the womb. The test results were also compared with those of 598,000 other New South Wales children. NAS children's test scores, on average, were sharply lower than those of both groups of children. By seventh grade, their scores were lower than those of fifth-grade children. The study only found an association between NAS status at birth and lower test scores later in school. The cause of these effects is uncertain, the study authors said. Neonatal abstinence syndrome occurs when addictive drugs such as opioids or sedatives pass through the placenta during pregnancy. "These drugs cause brain cells to die more quickly and impair their proper development," said study lead author Dr. Ju-Lee Oei. She's a senior neonatologist at Royal Hospital for Women in New South Wales. Families affected by addiction also may be more "socially chaotic," the study authors said. Oei conceded that it's impossible to tease out the effects of children's home environment in this study. Her next project will tie in that data. Nevertheless, she said it points to the need for greater family outreach. "Early intervention and support for both the mothers and their children have been shown to be extremely effective in high-risk populations, and the benefits can extend for decades and even into generations," Oei said. Dr. Siobhan Dolan is an obstetrician/gynecologist at Montefiore Medical Center in New York City, and a medical advisor to the March of Dimes. She said prevention is the key. "Every piece of outcome data [on children with NAS] is telling us how concerning this is," Dolan said. "Now we need to identify women [with opioid-use disorders] and get them into treatment and provide support," she said. The findings were published online Jan. 16 in the journal Pediatrics. The study was partially funded by the Cerebral Palsy Alliance in Australia.